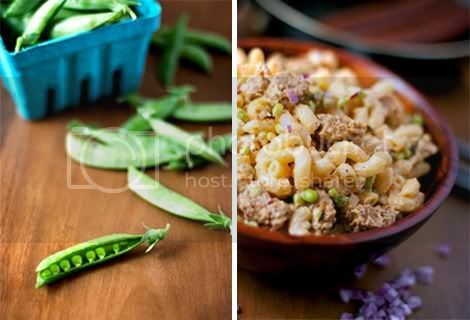 My mother makes this amazing macaroni salad with canned baby shrimp and very young small sweet peas, and if you asked me to pick one dish from childhood that I'd most like to have over and over again today, that macaroni salad with baby shrimp and peas would be it. Though I eat healthy most of the time, I am one of those people who as a general rule truly adores all things pasta-y and mayonnaise-y — anything rich and creamy, and the more carbs, fat and calories, the better. So? Since it's BBQ season and we'll all need an arsenal of delish side dishes to whip up and serve to guests (or take along with if you plan on being an extra-good guest), it was only natural for me to make a salad inspired by Mom's. This macaroni salad is pure vegetarian (vegan). That means no shrimp and no mayo — I just used Mom's as a jumping off point and came up with something that has a similar flavor and some added kick (Field Grain chipotle veggie sausage!). If you're a lacto-ovo vegetarian, you can certainly use real mayo in this recipe but I highly recommend tracking down some Vegenaise and giving it a try. I fell in love with Vegenaise the moment I tasted it and I think it tastes better than mayonnaise — even Mom herself is a Vegenaise fan. If you're not sure where to find the brand in your area, check out their handy store locator. 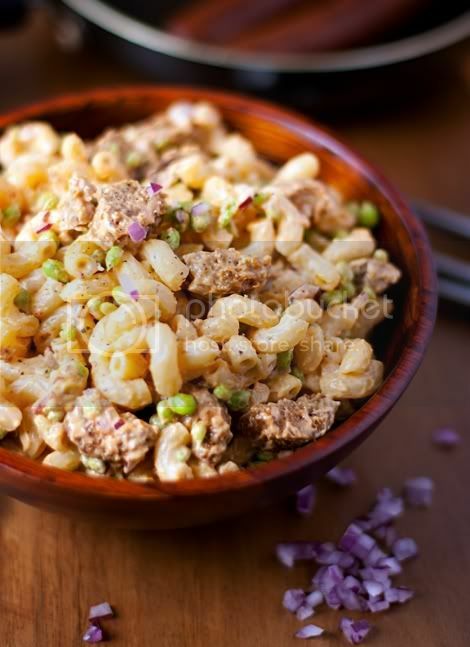 Prepare the macaroni salad: In a large bowl, combine the macaroni and lemon juice. Add the Vegenaise and stir to incorporate. Fold in sausage, peas and onions until evenly distributed and fully combined. Season with salt and pepper to taste. Serve immediately, or chill covered in the refrigerator for up to overnight before serving.